I need to stand there, I need to look him in the eye and I need to know that it's him. In the opening title sequence of the 2007 mystery-thriller Zodiac, we get an endearing glimpse into the morning routine of a father and son in late ’60s San Francisco. Through cinematography by Harris Savides, we are presented with the bones of the story: large city, single dad, young child, bustling newsroom. A golden hue permeates throughout, oscillating between sickly jaundice and warm glow, but always there. After all, this is a turn on the true crime story of the Zodiac Killer, and so a subtle sense of sepia is practically mandatory. You can almost smell the coffee, feel the texture of the pages, faded and dusty. Added to this is the nuanced and delicate title design by Bruce Schluter and Eric Ladd which converts the letters of the credits into a cipher. Already, the viewer is being invited into a codified world, concealed beneath the presentation of fact. Director DAVID FINCHER speaks about the Zodiac title sequence in this excerpt from our feature article David Fincher: A Film Title Retrospective. 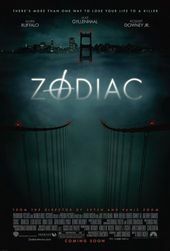 DF: [Zodiac] was much more in the vein of Social Network. We had a job to do: we had to send this guy off to work, he’s got to drop his kid off, we’ve got to set up San Francisco in 1969, so its function is primarily narrative and then the titles just need to be included.